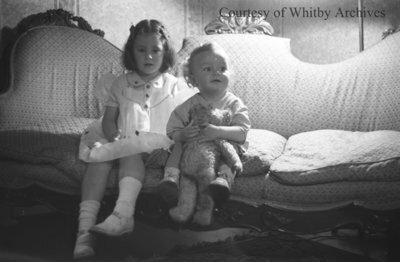 A black and white negative of Jane and Andrew Holliday sitting on a couch. In this view Jane (left) is looking down. Andrew (right) is holding a stuffed toy and looking to the right. Inscribed on the negative envelope is the name Holliday - Andrew. Holliday Children, June 1939, Marjorie Ruddy. Whitby Archives A2013_040_768C.